Guardians of the Galaxy Vol. 2 is now in theaters, and to commemorate the film’s release Hot Toys has announced a second wave of Guardians of the Galaxy Vol. 2 Cosbaby Bobble Head Mini Figures! GotG Vol.2 Cosbaby Series 2 includes Star-Lord, Rocket Raccoon, Baby Groot, Mantis, Yondu and Nebula released both individually and in two box sets. 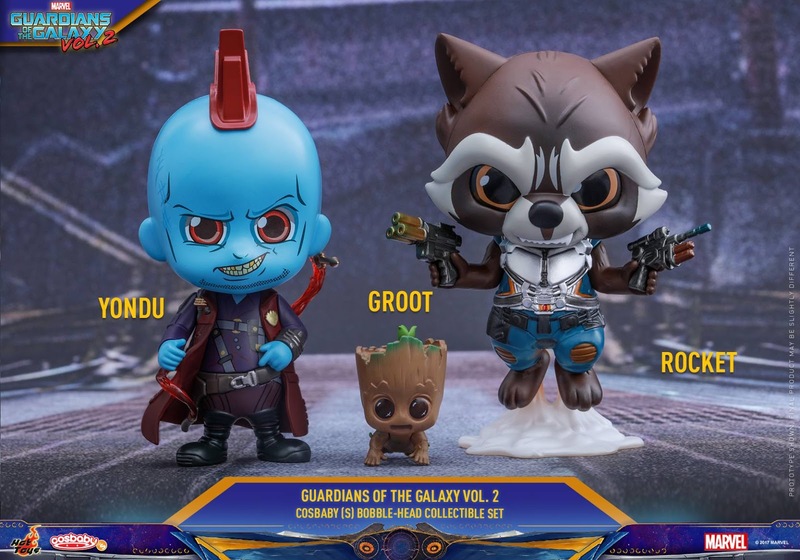 First up is a box set with Yondu and Rocket Raccoon with Baby Groot on his head. Yondu is cool and stylish with his Mohawk fin, velvet-coloured trench coat and purple suit. He also has his Yaka Arrow ready for launch. The Rocket Cosbaby carries two guns and it is flying in mid-air with his duo jetpack. Being his best partner, the cute Baby Groot just lies comfortably on Rocket’s head (thanks to a new magnetic feature) with such an adorable innocent expression. The second Marvel’s Guardians of the Galaxy Vol. 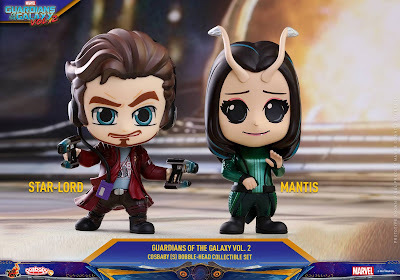 2 Cosbaby Mini Figure Series 2 Box Set includes Star-Lord and Mantis. Star-lord comes wearing a headset attached to his cassette player, dressed up in his long velvet-red jacket, t-shirt and holding his Element Guns, creating a great contrast with Mantis in her green outfit waving to say hello to fans. 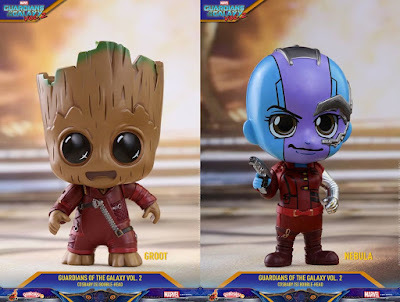 Along with these two awesome collectible sets, Nebula and “Ravager Outfit” Groot Cosbaby mini figures will be sold individually. Nebula is dressed in her red battling suit carrying a gun, while Baby Groot comes sporting his new Ravager battling suit. Don’t miss the chance to complete your Guardians of the Galaxy Vol.2 Cosbaby collection!